The Open Your Eyes Fund invites you to the join the TEMPLE SHALOM community for a continuation of our programs designed to celebrate creativity and the Jewish spirit, when we host a screening of the award winning documentary RAISE THE ROOF on Sunday December 4 at 4:30 p.m. There were once hundreds of magnificent wooden synagogues in Poland. The Nazi occupiers burned those that remained to the ground in 1939. Not one remained standing. Inspired by images of these exceptional 18th century houses of worship, artists Rick & Laura Brown of Handshouse Studio and faculty at Massachusetts College of Art and Design, set out to reconstruct a replica of the stunning, mural-covered Gwozdziec synagogue. Working with a team of 300 artisans and students from around the world, using only period hand tools and techniques, the Browns finally realized their dream. In 2014. The show-stopping reconstruction of the Gwozdziec synagogue roof was unveiled as the centerpiece of the new POLIN Museum of the History of Polish Jews, in Warsaw. 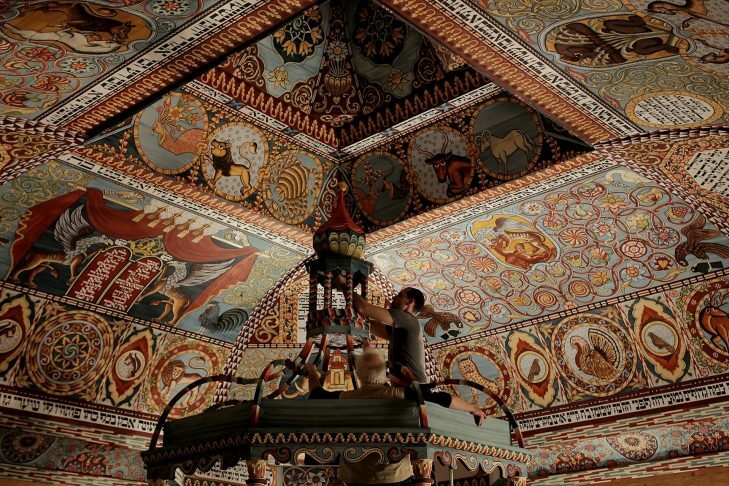 Father and son filmmakers Yari & Cary Wolinsky have beautifully captured the recreation of the synagogue roof in this documentary film, RAISE THE ROOF. Join us for a large screen projection of this critically acclaimed film at Temple Shalom. You will learn about this remarkable 10 year project told against the backdrop of the 1000 year history of the Jews in Poland and will have the chance to meet and talk with the Browns and the Wolinskys after the film.